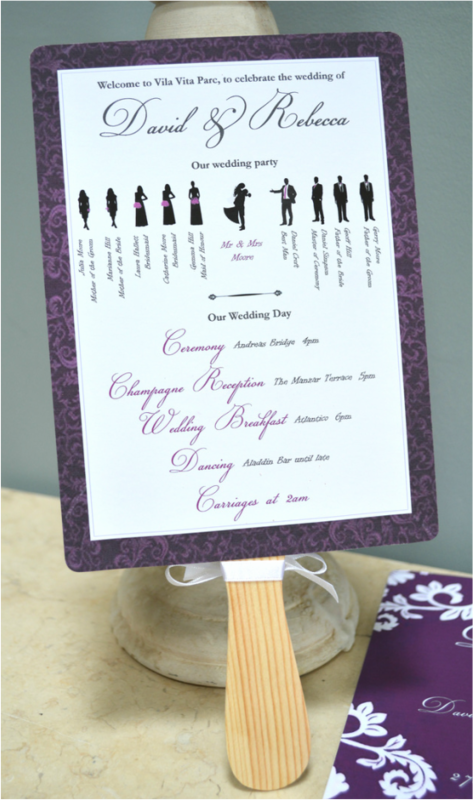 All of our wedding fans are hand made and personalised with your details. 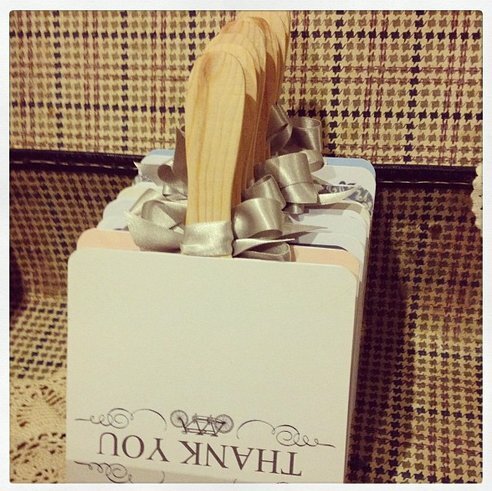 The paddle fans have a lovely pine handle shaped like a lollipop stick. Our fan handles have been designed so that they offer strength to the fan, in addition we use a good weight of card so your fan will feel strong in your hand. Our design service ensures your fans are totally unique and personal to you. 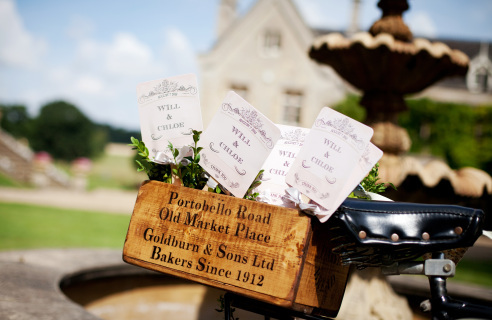 We offer numerous proofs to ensure you are entirely happy with the design before they are made. Each fan is designed personally by myself. As an Illustrator of 20 years I now take immense pleasure in designing lovely wedding accessories like our fingerprint guestbooks & glass feather baubles. 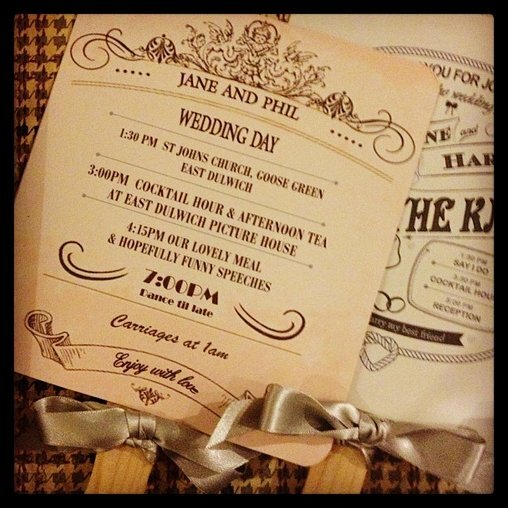 I particularly enjoy working on the wedding paddle fans. Be creative, I love to work on new ideas. Wedding favours displaying your menu. Specific details i.e. 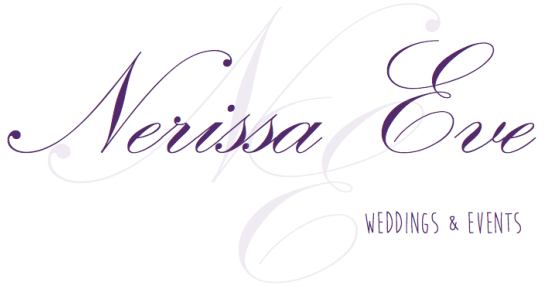 wedding website for photo uploads. 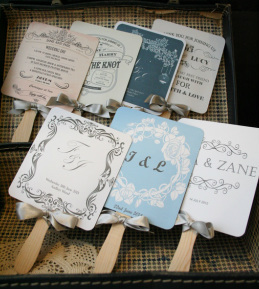 Add a wedding map to the back of the fan from the church to the venue. Due to the individual nature of each fan please get in touch with your ideas and we will return a quote. The price per fan is £2.50 for quantity orders of 60 and above. We are happy to produce small numbers however the length of time it takes to design the fan is the same for orders below 60 therefore we will have to charge a design fee. Beautifully designed and crafted Hand held fans. Made from quality card. Fans are approx 13cm x 14.5cm. Handle made of strong pine is shaped to fit the hand and measures approx 8.5cm. 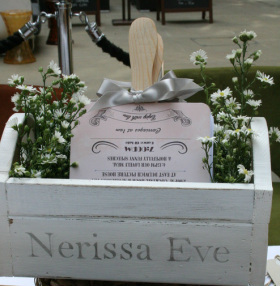 You choose the wording and the colours, after placing your order we will contact you to confirm all design details. We will send you a proof of your design and don't worry nothing is finalised until you are entirely happy with the design. Fans are priced individually, design service is included. Due to the individual nature of each fan design and the numerous possibilities it is not possible to display every option here. In order to ensure you are fully satisfied with your fan, please check out with Paypal and I will be in touch to discuss your design. 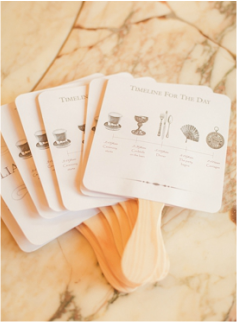 We ask for at least 3 weeks from proof approval to make up your fans particularly during the wedding season so please allow enough time when ordering your fans. If you need it fast just get in touch, we will always do everything we can to help out. If you prefer to get in touch before you buy your fans no problem, fill in the contact us form or give me a call for a chat. There is a minimum order quantity of 50 fans. If you would like to order less than 50 fans please get in touch, there will be a design fee for a quantity below 50 as the design process for a small number of fans is the same as for a large quantity of fans.